NEW YORK - Home prices tumbled by the steepest rate ever in May, according to a closely watched housing index released Tuesday, as the housing slump deepened nationwide. No city in the Case-Shiller 20-city index saw price gains in May, the second straight month that's happened. The monthly indices have not recorded an overall home price increase in any month since August 2006. Home values have fallen 18.4 percent since the 20-city index's peak in July 2006. Nine metropolitan cities — Las Vegas, Miami, Phoenix, Los Angeles, San Diego, San Francisco, Seattle, Wash., Portland, Ore., and Washington, D.C. — posted record declines in May. And the value of housing in Detroit is now lower than it was in 2000. But a possible bright spot in an otherwise dismal report, seven metros — Tampa, Fla., Boston, Detroit, Minneapolis, New York, Dallas and Atlanta — showed smaller annual declines. Las Vegas recorded the worst drop, with prices plunging 28.4 percent in the month. Miami came in a close second, with prices down 28.3 percent. There was an interesting article in the Wall Street Journal a few weeks ago by David Wessel discussing differences between the housing index produced by the Office of Federal Housing Enterprise Oversight (OFHEO) and Standard & Poor’s Case-Shiller index. Since Zillow recently released our Q4 2007 Home Value Reports, I thought I’d extend Mr. Wessel’s analysis with a comparison of the Zillow Home Value Index (Zindex) to both the OFHEO and Case-Shiller numbers. So, how does the Zindex compare to the two most common flavors of weighed repeat sales indexes? The table above compares year-over-year changes in market values for OFHEO, Case-Shiller and Zillow for selected markets between the third quarter of 2006 and the third quarter of 2007 (the same markets and periods compared by Wessel in his article). Also added to this table are the Pearson correlation coefficients between the three measures (an indicator of how similar the various measures are to one another). Zillow and Case-Shiller are fairly similar to each other with a correlation of 95% and median absolute error of 1.5%. OFHEO, on the other hand, is about equally dissimilar to both Zillow and Case-Shiller with a correlation of 50% with both other measures (median absolute error of 5.3% when compared with Zillow). "Second-quarter home prices fell 9.9 percent from a year earlier, giving 29 percent of owners negative equity, said Zillow, the Seattle-based service that offers values for more than 80 million homes. For those who bought at the 2006 peak of the housing market, 45 percent are now underwater, Zillow said. Negative equity and declining prices are making it difficult for homeowners to sell property for a profit. Almost one-quarter of U.S. homes sold in the past year were for a loss, Zillow said. That contributes to the foreclosure rate because some homeowners can't absorb the loss and end up surrendering their homes to the bank that holds the mortgage, said Stan Humphries, Zillow's vice president of data and analytics." "The highest percentages of homeowners with negative equity were located in California. In four of the state's metropolitan areas -- Stockton, Modesto, Merced and Vallejo-Fairfield -- the number of homeowners whose mortgage debts exceeded the values of their properties topped 90 percent, Zillow said. In five more California areas -- the Inland Empire (Riverside-San Bernardino), Bakersfield, Yuba City, El Centro and Madera -- the percentages were more than 80 percent. " Home values nationwide declined nearly 10 percent over the past year, leaving almost one-third of homeowners who bought in the last five years in negative equity. Zillow’s Q2 Real Estate Market Reports monitor 165 metropolitan statistical areas (MSAs), and monitor home value change, homeowner equity and rates of negative equity and “distress signals” – including homes selling at a loss and foreclosures. What's the latest with the US house builders share prices? PHM is "in the middle" (black line above) and may be the best bellwether. It tried to break out above the 252d.MA in the summer, but could not hold its gains. It now looks like it may have to retest its lows (in 2009 with another selloff in stocks perhaps). If that happens then the trendlines and 252d.MA will work its way lower, and provide the scenario for a nice upwards break by late 2009/ early 2010. That would be a early signal that the physical market may make a bottom. How much of a rally would come after that is a good question. OR: I may be completely wrong about the retest, and it will rally from here. But I would wait for the signal: a convincing break of the 252d.MA by at least three of these stocks. Dec. 30 (Bloomberg) -- Home prices in 20 major U.S. cities declined at the fastest rate on record, depressed by mounting foreclosures and slumping sales. The S&P/Case-Shiller index declined 18 percent in the 12 months to October, more than forecast, after dropping 17.4 percent in the year through September. The gauge has fallen every month since January 2007. Year-over-year records began in 2001. Economists forecast the 20-city index would fall 17.9 percent from a year earlier, according to the median of 21 estimates in a Bloomberg News survey. Projections ranged from declines of 17 percent to 18.4 percent. Compared with a year earlier, all areas in the 20-city survey showed a decrease in prices in October, led by a 33 percent drop in Phoenix, a 32 percent decline in Las Vegas and a 31 percent drop in San Francisco. Dallas posted the smallest 12-month decline, at 3 percent, followed by a 4.4 percent drop for Charlotte and a 5.2 percent fall in Denver. New York City posted a 7.5 percent drop. “The bear market continues,” David Blitzer, chairman of the index committee at S&P, said in a statement. The declines in Atlanta, Seattle and Portland surpassed 10 percent for the first time, he said. The 20-city index is down 23 percent from its 2006 peak. Fourteen of the 20 metropolitan areas showed record declines in the year ended in October. Home prices decreased 2.2 percent in October from the prior month after declining 1.8 percent in September, the report showed. The figures aren’t adjusted for seasonal effects so economists prefer to focus on year-over-year changes instead of month-to-month. Six cities, including Atlanta, Charlotte, Detroit, Minneapolis, Tampa and Washington, had the largest one- month drop on record. Other housing reports this month have shown property values are deteriorating even faster as foreclosures climb. Home resales, which account for about 90 percent of the market, dropped in November and median-home prices fell 13 percent from a year earlier, the most since records began in 1968, the National Association of Realtors said last week. Foreclosures and so- called short sales, or purchases at less than the value of the outstanding mortgage, accounted for 45 percent of last month’s home purchases, the agents’ group also said. The share of mortgages delinquent by 30 days or more and those already in foreclosure rose to all-time highs in the third quarter, the Mortgage Bankers Association said Dec. 5. Declines in home construction have subtracted from economic growth since the first quarter of 2006. Weak housing construction is likely to remain a drag on the economy until sales and prices improve. Lennar Corp., a U.S. home construction company that builds in 14 states, reported its seventh straight quarterly loss on Dec. 18. “Frankly, we’re in the midst of a downward spiral and the momentum is building,” Chief Executive Officer Stuart Miller said on a conference call with analysts. All 20 metro areas, and the two composites, posted their third consecutive monthly decline. In addition, eight of the MSAs posted their largest monthly decline on record – Atlanta, Boston, Charlotte, Chicago, Dallas, New York, Portland and Seattle. Although in decline over the past few years, some of these regions have out-performed on a relative basis, when compared to the national average. It is clear, however, that the decline in home prices is affecting all regions regardless of geography or employment opportunities. Notice how big the mom drops were in even the "best 4" cities. Somebody show wheel out those old US property bulls, and ask them "to explain." Feb. 24 (Bloomberg) -- Home prices in 20 U.S. cities declined 18.5 percent in December from a year earlier, the fastest drop on record, as foreclosures climbed and sales sank. The decrease in the S&P/Case-Shiller index was more than forecast and followed an 18.2 percent drop in November. The gauge has fallen every month since January 2007, and year-over- year records began in 2001. Record foreclosures are contributing to declining property values and household wealth, crippling the consumer spending that makes up about 70 percent of the economy. The Obama administration has pledged to spend $275 billion to help stabilize the housing market, including $75 billion to bring down mortgage rates and encourage loan modifications. “Falling home prices are prompting potential homebuyers to wait for an even better purchase price,” Steven Wood, president of Insight Economics LLC in Danville, California, said before the report. “Housing’s contribution to economic growth will be significantly negative again” in the first three months of 2009, he said. Economists forecast the 20-city index would fall 18.3 percent from a year earlier, according to the median of 28 estimates in a Bloomberg News survey. Projections ranged from declines of 17.4 percent to 19 percent. Compared with a year earlier, all areas in the 20-city survey showed a decrease in prices in December, led by a 34 percent drop in Phoenix, a 33 percent slide in Las Vegas and a 31 percent decline in San Francisco. S&P/Case-Shiller also released quarterly figures for home prices nationally. That measure showed an 18.2 percent drop in the three months through December from the same period in 2007, compared with a 16.6 percent year-over-year decline in last year’s third quarter. Consumer confidence this month probably sank to a record low as more Americans become concerned about job losses, economists say the Conference Board’s sentiment index will show today at 10 a.m. The 20-city index is down 27 percent from its 2006 peak. Home prices decreased 2.5 percent in December from the prior month, exceeding the November decrease of 2.3 percent, the report showed. Professor Robert Shiller stopped by TechTicker last week. Video above. Key points below. * House prices are still only halfway back down to fair value. * Prices don't usually stop at fair value. * Obama's plan won't turn house prices around. Checkout those new build sales numbers !!!!! The Case Schiller index released the December 2008 numbers yesterday, with what seems to be little fanfare. Most everyone expected the numbers to continue to show eroded values in home sales across the nation- They did not disappoint. The Composite 20 index is off 18.5% over last year and 27% from its peak, while the Composite 10 index fell 19.2% in 2008 and 28.3% from its peak. The 10 city index has been around since January 1988 while the 20 city index has been tracking numbers since 2001. These numbers reflect the worst year over year drops in value since the inception of the index, however the precipitous drop is showing signs of slowing when compared to November numbers. Leading the charge of falling prices are Phoenix down 34% year over year for 2008. The city has fallen 45% from its peak. Next in line were Las Vegas down 33% and San Francisco down 31%. Los Angeles, which includes Orange County dropped 26% ranking 5th worst. Overall, U.S. home prices are now at 2003 levels, according to the index. I think the work Robert Shiller has done is superb, but I think his charts need to come with a health & safety warning. He only uses the official CPI numbers when inflation adjusting. That makes them way way out from reality. In reality the prices have not gone up as much as his charts suggest, and they have fallen A LOT more than they suggest as well. Recession ===== : Peak of Median Price : Trough, Median Price : P-to-Tr. The median price of an existing single-family home at $183,300 (down 4.2% mom) in October is down 11.2% from a year ago – the largest drop on record (see chart 4). The inventory of unsold existing homes rose to a 10.2-months supply in October from a 10-month mark in September. The elevated level of inventories implies that additional price declines are nearly certain in the months ahead. House prices fell by 19.1% in the first three months of the year from the same time last year, the Standard & Poor's/Case-Shiller National Home Price index suggested. It also showed home prices had fallen 32.2% since peaking in the second quarter of 2006. However, it suggested that the pace of month-on-month declines had slowed. The housing index, which looks at 20 key cities, saw prices fall by 18.7% in March from the year before. These declines were slightly better than February's falls, and it was the second straight month that indexes did not post record drops. But there were still no signs that home prices had hit the bottom, said David M Blitzer, chairman of the S&P index committee. "We see no evidence that a recovery in home prices has begun," he said. with the jump led by a 43 percent surge in the Midwest. Sales increased to a 384,000 pace, higher than forecast. The number of houses on the market dropped to the lowest level in more than 10 years. Falling prices, and near record low interest rates have lured buyers. Wells Fargo says sentiment has risen in 5 of the last 6 months. ...Looks like it wants to run to $11-12 soon. It could even make a run for the gap at $14-15. The vulnerability here is clear : What if rates rise again? The S&P/Case-Shiller Home Price Index ... fell 17.1 per cent in May compared to the same month last year. The index follows property prices in 20 cities across the US. Although house prices were still significantly lower than in 2008, the year-on-year fall was not as bad as that of April, when prices were down 18.1 per cent on the previous year. After 16 months of consecutive worsening monthly declines, starting in October 2007, there have now been four months in which prices declines have improved month-on-month. David Blitzer, chairman of the index committee, said: "This could be an indication that home price declines are finally stabilising". Meanwhile, the Conference Board, a private research group, said that its Consumer Confidence Index fell in July to 46.6 points, down from 49.3 points in June. A Reuters poll showed that economists expected a reading of 49. A reading of 90 or above means that the economy is expanding. It was the second consecutive monthly decline in the index, which is based on a survey of 5,000 households. Looks like our old favorite, Cleveland, may be the first to go positive, year-on-year. That one month gain of 4.1% was impressive. The Case-Shiller Home Price Index has increased yet again. This marks the fifth consecutive monthly increase in house prices in the United States. Prices are now only 11.3% lower in the Composite-10 cities and 9.3% lower in the more comprehensive Composite-20 cities than at this time last year. However, diffusion is breaking down. When the Case-Shiller index began increasing in July, 14 of 20 markets were showing an increase. This number steadily increased as time wore on. Case-Shiller reported in August that 18 of 20 cities showed price increases. When Case-Shiller reported in September, 18 of 20 cities showed price increases. Then, last month the number turned down slightly to 17 of 20 markets. This month the number really turned down. Only 10 of 20 markets rose in the data (for sales through September). That is not good. is this a one-month aberration? It’s hard to say, but clearly this should be worrying because bank collateral depends on it. Homeowners looking to escape negative equity depend on this. And renewed declines will most certainly have a negative effect on consumer confidence. August's decline was the largest here since June 2009. Nationally, home prices were up 1.7 percent from last year in the monthly Case-Shiller survey. But more than half the 20 cities in the report suffered annual declines. Case-Shiller analysts called the latest numbers disappointing. Mon: comp20, YoYr.% : +mom% / CSXR10 YoYr.% : mom% / Average : Exist. : New ..
the banking system is a confidence trick designed to ENSURE that x% of the populous file for bankruptcy each year, and the banks seize their assets. the end game is the bankers end up owning everything. If the Debt (red line) had risen much more gently, then maybe equity could have kept growing. 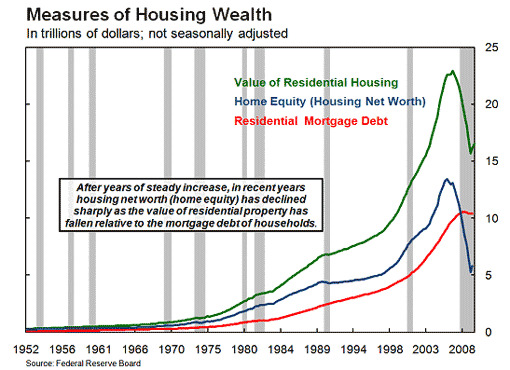 Ramp up debt too hard and you destroy equity, because the long term balance gets destroyed, and homes get built in the wrong places. Too many homes were built quickly in the outer ring suburbs. Raise oil prices, and it becomes uneconomic to live there. Raise oil prices far enough and fast enough, and the whole "suburban project" becomes naught-but-malinvestment. The US should have been imposing taxes on oil to slow the spread of suburbs, not cutting rates to near zero to speed up their development. The wrong move created more zombies. But at least in the US many zombies are now being buried, and few new ones are being created. The US is working through its housing nightmare, while the UK has barely started to do so.